Interestingly, many of you would have noticed that we feel happier spending more time in the kitchen in the winter, because well, the warmth of the kitchen is kind of soothing! Lots of people love to bake in the winter, not just because Christmas is around the corner, but also because the aroma of melting butter and caramelized sugar just warms your heart in the winter months. Oh well, there is just too much to enjoy in December – and a month seems like too little time, so let’s not delay any longer. Pick up your shopping bags and head to the market. 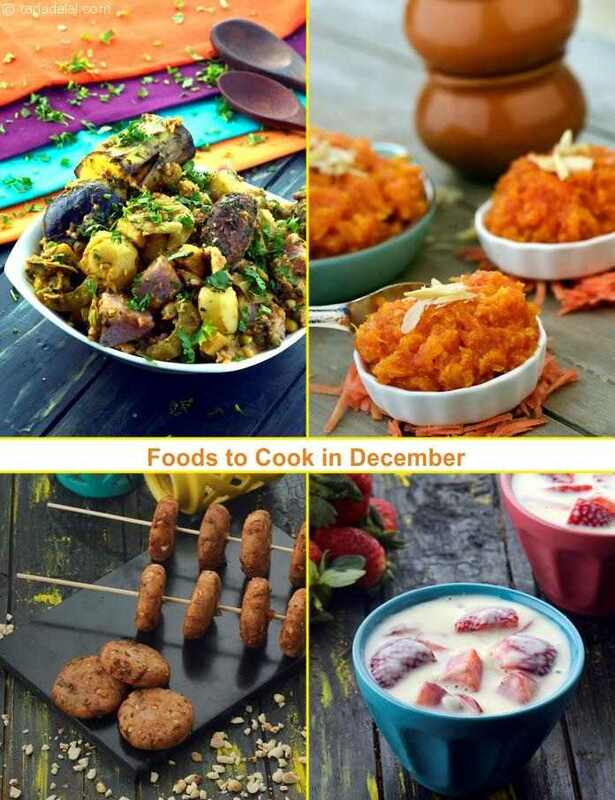 Load it with the best and brightest of the seasonal fruits and veggies – firm, red strawberries, flawlessly green surti papadi, juicy carrots; bright and fresh sarson and of course, the season’s very special kand, Purple Yam. It’s nice to make salads with carrots and subzis with kand and surti papadi, but also do something different. Try the Clean Sweep, Carrot and Parsley Juice or the all-time favourite Gajar ka Halwa. Go for regional specialties like Lilva Rice, Oondhiya and Sarson ka Saag, and indulge in delicacies like Kand Aloo Pakoda, Kand Tikki and Kand Wafers! Strawberries, of course, are just right for dessert – make them into a mouth-watering Strawberry Mousse or Strawberry Praline Cake, or simply relish them as Strawberries in Custard Sauce. Sweet Lime also called as Mosambi: Mosambi’s are freely available in November and December and you will very always find them sweet in taste and very rarely sour. If you have tried all these and still have lots more of these seasonal produce left, head straight to our website or open our app and pick out from the endless number of recipes we have there!